Today is Ash Wednesday, the first day of the Christian season of Lent. Lent comes from the Old English term for “lengthen.” As Easter approaches the amount of daylight grows longer. More than a thousand years ago followers of Jesus began to set aside the 40 days before Easter as a kind of annual spiritual journey – an opportunity to reconnect with God in specific ways. This year Easter Sunday is April 16. If you do the math you’ll discover that there are actually 46 days between February 18 and April 5. The six “extra” days represent the six Sundays during Lent. Some Christians treat these Sundays as “little Easters” – they are like rest stops on the journey in which some folks choose step back, for 24 hours, from their Lenten commitments. By Lenten commitment, do we mean giving something up? Yes, a number of people choose to give up something for Lent. Think of taking something out of your backpack before beginning a 40-day hike. “I choose not to carry this around with me for the next six weeks.” Think of it as an expression of hope. During the Middle Ages it was common for Christians to give up meat, fish, eggs, and butter throughout Lent. Nowadays it’s more typical for Westerners to surrender one of those things that can approach the level of addiction – perhaps caffeine, soda, coffee, chocolate, television, social media, or computer games. It doesn’t take much for us to realize that these are probably things we could and should surrender for far longer than 40 days. Can Lent also be a time to “take on” a new habit or practice? Absolutely. The balance, in fact, is quite healthy. Just as we leave something behind on this spiritual journey, we also pick up a new perspective or behavior or commitment. This is also an expression of hope. You might consider an accelerated pattern of personal prayer or Bible reading. Or writing a daily thank-you note to 40 different people. Or pursuing a specific strategy to serve the poor. Or a daily break in which you stop and enjoy a few minutes of intentional stillness. This year there’s another option. 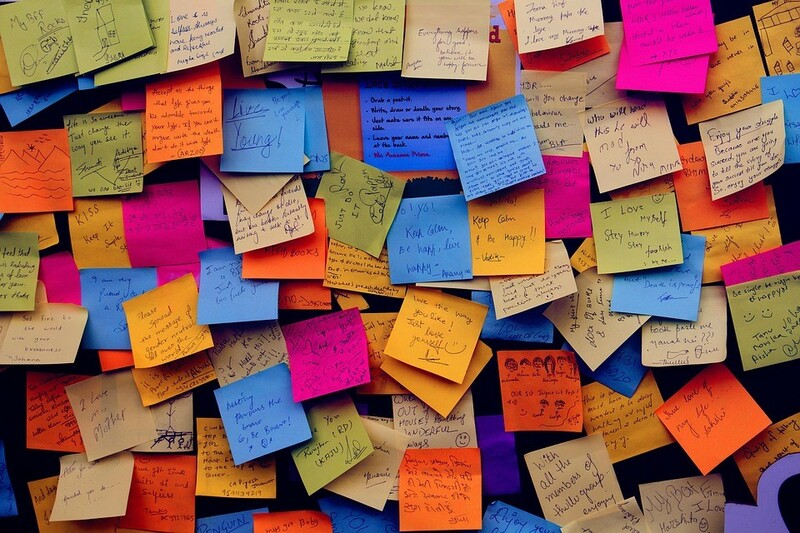 Write a message on a Post-It note. With one word or a few words or even a short paragraph, address this question: Where do you hope to see God at work between now and Easter? Where do you hope to see God at work in your department? In your family? In our nation? Or in your own heart? You might put a Post-It note on a cross of your own, or in a place where you’re likely to see it. Casting our hopes on God is itself an expression of hope. And the cross just so happens to be the place where our deepest hopes become reality.